Jia Zhangke's Golden Lion winner tells two contemplative and compassionate stories of a man and woman searching for absent spouses in an ancient town on the Yangtze River. Set against the spectacular landscape of the Three Gorges region, Jia Zhangke's humane and moving Golden-Lion winner tells two contemplative and compassionate stories of a man and a woman searching for absent spouses in Fengjie, an ancient town on the Yangtze River which is being demolished and will soon vanish for ever in the flooding caused by the controversial Three Gorges hydroelectric dam project. At the same time as offering a revelatory, thought-provoking portrait of people adrift in a world they no longer recognise, Still Life also reveals their energy, resilience and ability to reach new understandings. 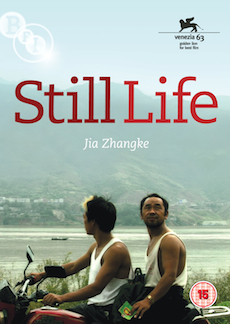 With long, uninterrupted takes, Jia Zhangke subjects the changing landscape to intense lyrical scrutiny, illuminating the relationship between individuals and their environment and the strange co-existence of man-made squalor with so much natural beauty. Feature Commentary by Tony Rayns.